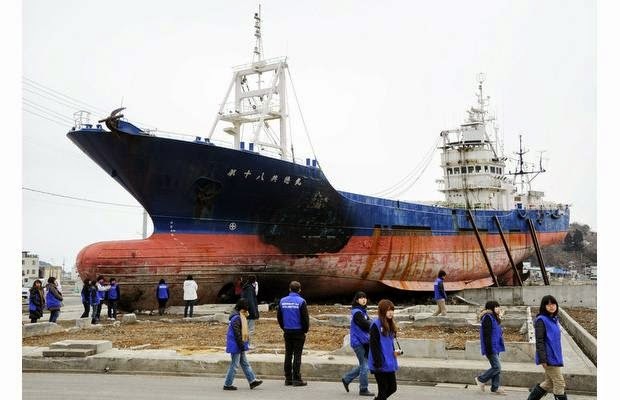 TenguLife: The curious guide to Japan: The meaning of "maru"
Kyotoku-Maru is better known as the tsunami ship having been lifted by the great waves of March 11, 2011 and deposited somewhat unceremoniously about half a mile inland. The Toya-Maru was a ferry between Hokkaido, the northern island of Japan, and Honshu the main island. It went down in a typhoon in 1954 with the souls of over one thousand onboard. And the Ehime-Maru suffered the ultimate fate as it was accidentally struck by a US submarine in 2001. Mori-san, the then Prime Minister, electing to continue his game of golf when he received the news surprised no one at the time. Unlike the traditions of many countries, Japanese ships are never named after individuals. Non-milliatary vessels most commonly carry the suffix "-Maru" in their title; a tradition dating back to the pre-shogunate era of the sixteenth century when Toyotomi Hideyoshi called his flagship The Nippon Maru. The nomenclature was approved by the Emperor and stuck, remaining in place to this day. And although the kanji for the word "-maru" depicts a circle it can be seen more to represent the completion of a journey, the safe return to port. And so Japanese merchant ships carry the designation maru to represent good luck and the life giving sanctuary from the sea brought by the vessel. Though how a modern trawler can be sunk by a modern submarine practicing an emergency surfacing that was performed for the pleasure of joy riders is simply beyond understanding. Sometimes the -maru isn't quite enough to ensure the return to port but for most it brings them home safely. And that's why they are designated with the kanji for a circle.